Although Subarus are generally known for their off-road performance that isn't to say some don't call the track home, like Justin North's RSTi. Subaru is also known for their excessive model nomenclature like the Impreza WRX STi Spec C Type RA-R, but if North's doesn't seem familiar it's because it isn't a production model. What North has done is taken a US-spec Impreza 2.5 RS and replaced the brakes, drive, and power train with US-spec '05 STi bits. 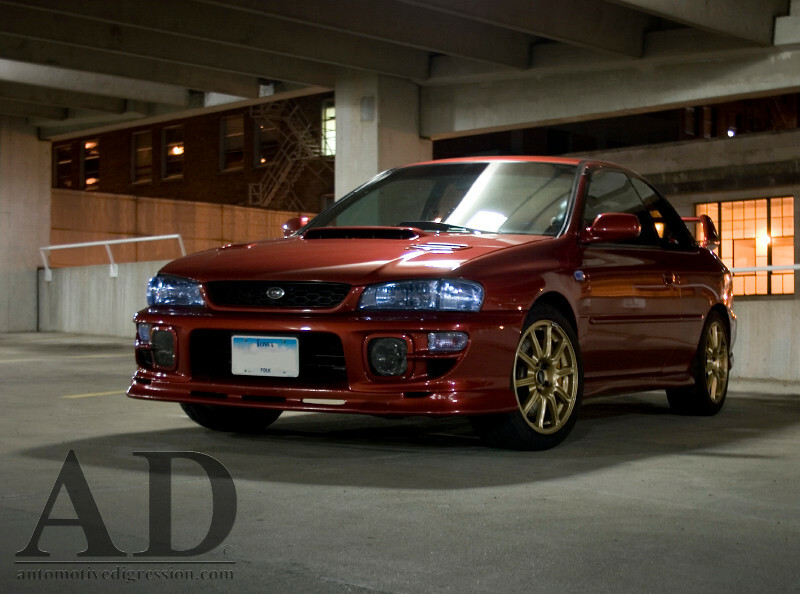 Now he has it all: Arguably the best looking model, the lightest Impreza chassis, Brembo brakes, 6-speed transmission, and a modified EJ257 that drinks E85, breathes through a Blouch Dom 3.0 XT-R ball bearing turbo, and puts down 441 horsepowers and 448 torques with all four wheels. That's enough power to propel this all wheel drive Japanese economy car down the 1/4 mile in 11 seconds. What makes that even better is that North built this Subaru to perform on tracks with corners, not Christmas trees. Bilstein's PSS9 coil-overs are used to keep the RSTi planted, 245/45/17 Bridgestone Potenza RE-01Rs wrapped around OEM STi BBS rims keep things under control, and in capable hands the result is a force to be reckoned with. I've had the good fortune of riding in this car and as impressive as the performance and the level of detail given to this build are, it's the owner that left a lasting impression on me. Justin is a knowledgeable and talented mechanic, a passionate racer, and genuinely a good guy. He has designed parts for SPT, Subaru's performance tuning division. In his spare time he does charity work like helping me swap motors in my Subaru, and by "helping" I mean doing 90% of the work in his well-equipped garage, and letting me crash at his place. So not only has he built one hell of a car but like I said, he's one hell of a good guy too. Categories: "Justin North", "RSTi", "Subaru", "Words"